Online piracy is generally seen as a major source of losses by the entertainment industries, with many studies backing the claim. However, the effects of piracy are quite diverse. New research reveals that DVD-sales are more impacted than box office sales, for example. At the same time, it shows that piracy has a promotional effect which brings in additional revenue. Statistics are great. As long as you have enough data points, you can ‘win’ virtually any argument by citing only those that support your claim. This technique is used everywhere, also in debates about copyright, especially when it comes to the impact of online file-sharing on revenue. Rightsholders frequently cite from studies that reveal major losses. At the same time, their opponents pick findings which clearly prove that there is no serious harm. Both may be right, but neither tell the full story. If you read the headline of this article it’s easy to see that the ‘pro-piracy’ side will gladly put the findings in their arguments folder. However, the same research actually has something in store for anti-piracy advocates as well. Liu conducted an in-depth study on the link between piracy and sales, using estimated download numbers from pirated torrents as a key variable. This revealed that different types of piracy can have different effects. After monitoring downloads and sales, including box office and DVD figures, for a period of 40 weeks and comparing it to the tracked piracy activity, he concludes that piracy does impact sales negatively. That said, its effect is far from uniform. “File sharing reduces the total revenue of the motion picture industry from the box office by $ 231 million in total or 2.71% of the current box office in the US for my sample of 40 weeks in 2015,” the article reads. On average, piracy results in a loss of roughly $500,000 per movie. That’s not insignificant. The bulk of the harm is not created at the box office though, but with DVD aftersales, the research found. “Unlike the box office, in the home-video market, DVD revenue decreases by a surprising 36% due to piracy,” Liu writes. What’s interesting to note is that not all piracy types have the same effect. For the earlier low-quality releases (CAM and TS), the “word-of-mouth” effect outweighs the negative effects on sales. Most of the harm is done by later high-quality leaks (WEBDL, DVDrip and BRRip), which compete directly with DVD and Blu-ray sales. While the net effect of piracy is negative, pirates can also serve as promoters. Through word-of-mouth ‘advertising’ piracy positively impacts box-office attendance, Liu estimates. “There’s some benefit from piracy, the word-of-mouth from piracy actually contribute to a total of $68.7 million to the industry box office and DVD revenue,” Liu says, clarifying that the figure applies to a period of 40 weeks and is limited to the US. “Consumer welfare decreases when we ban piracy, which is much higher than the increase in motion picture industry revenue,” Liu notes. That said, it’s unrealistic to expect that piracy could be banned entirely. Movie studios take down files and sites whenever they can, but a pirated copy is never hard to find. That brings us to another important finding. If a single movie is protected from piracy successfully, it ‘only’ gains an average $70,000 in additional revenue. 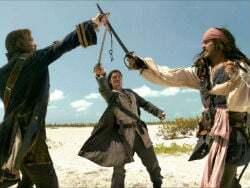 “Consumers who watch pirated movies simply like ‘pirated stuff’, so if studios try to report and remove torrents of a movie on the file-sharing network, the pirate consumers will just switch to other pirated movies. The improvement in revenue will be very small, around $70,000 on average per movie,” Liu tells us. That last point is important. If all piracy was eliminated, films would see a $500,000 increase in revenue per title. But in more isolated cases, which is what mostly happens today, the effect is much lower. The research offers several interesting insights, to say the least. However, it is not without shortcomings. As it only looks at BitTorrent traffic, it captures only a small part of the piracy ecosystem. In addition, tracking torrent downloads accurately also has its challenges. Liu aggregated completed counts form various BitTorrent trackers, which likely means that the downloads are overestimated. We would caution anyone from drawing strong conclusions from this or any other study. What it does brilliantly show, however, is that not all piracy is the same. The quality and timing of leaked files are crucial, and the effects differ greatly between the box-office and DVD aftersales.